Chart Easily. Code Accurately. Bill Instantly. Compromise Nothing. H-DOX offers you the most complete and affordable solution to take your practice electronic. It’s no surprise that healthcare leaders rely on H-DOX to deliver top outcomes and maximize revenue. Large groups to solo practices, H-DOX is the right fit. St Joseph’s Medical Center, Yonkers-Department of Cardiology, Nephrology, Pediatrics, Pulmonology, General Surgery - streamlines medical records, improves quality of care and patient satisfaction. DDIS, 42 locations, 1 million patients/year, collects MU stimulus, improves patient access to medical records. This Complete EHR is 2011 Edition compliant and has been certified by an ONC-ACB in accordance with the applicable certification criteria adopted by the Secretary of the U.S. Department of Health and Human Services. This certification does not represent an endorsement by the U.S. Department of Health and Human Services or guarantee the receipt of incentive payments. Vendor : H-DOX Bioinformatics inc, certification year 2011. 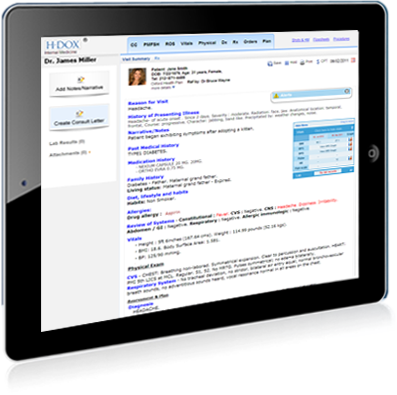 Product version: H-DOX 3.1, Complete EHR Ambulatory.